I only recently discovered Ben & Jerry’s Cherry Garcia ice cream, which must make me the last person on the planet to do so as it is their number one selling flavor. A few weeks ago on a particularly hot summer day the husband and I roamed over to the nearest 7-11 to pick up some ice cream treats and I paid a whopping $3 for a Cherry Garcia ice cream bar. While stupidly over-priced, it was also stupidly delicious. After my fingers were stained blood red and I’d successfully developed a case of carpal tunnel, the cherries were prepped and ready to go. 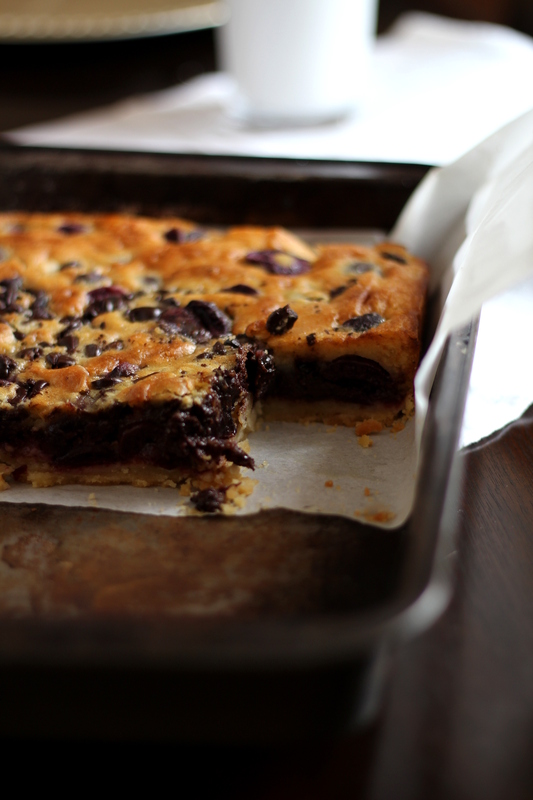 I made a shortbread crust and a brown butter filling to contain all of the ooey-gooey cherry-chocolate madness. 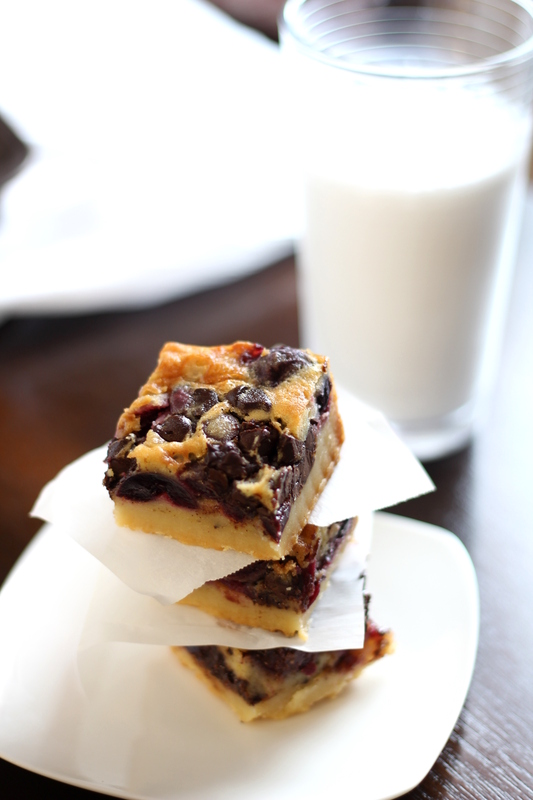 The brown butter flavor really adds a layer of complexity to these bars and plays up the flavor of the fresh cherries. Waiting for these babies to cool was by far the most difficult part of the process. Ohhhh yeahhhh (make sure you read that with the Kool-Aid man’s voice). The delicate buttery flavor of the shortbread works so well with the complexity of the brown butter. I’m considering making a cranberry and cream cheese version with a graham cracker crust when the holidays come back around. Preheat your oven to 375 degrees Fahrenheit. Line a 9″ x 13″ baking pan with parchment paper, letting the paper come up the sides. Take the 3/4 c. melted butter and mix with 2/3 c. white sugar and the vanilla bean caviar in a medium bowl. Add the flour and salt and mix with a spatula until combined. Dump the dough into the prepared baking pan and press into shape using your fingers. Bake the shortbread crust for 17-19 minutes, or until golden and puffed. Remove from oven and let cool on a wire rack. Keep the oven on. Meanwhile, toss the cherries with a heaping spoonful of all-purpose flour. In the bowl of a stand mixer (or use a regular bowl and hand mixer), use the whisk attachment to combine the sugar, eggs, and salt. Add half of the flour, then the bourbon, the rest of the flour, and the vanilla bean caviar. Once smooth, slowly pour in the browned butter with the mixer running to incorporate into the mixture. 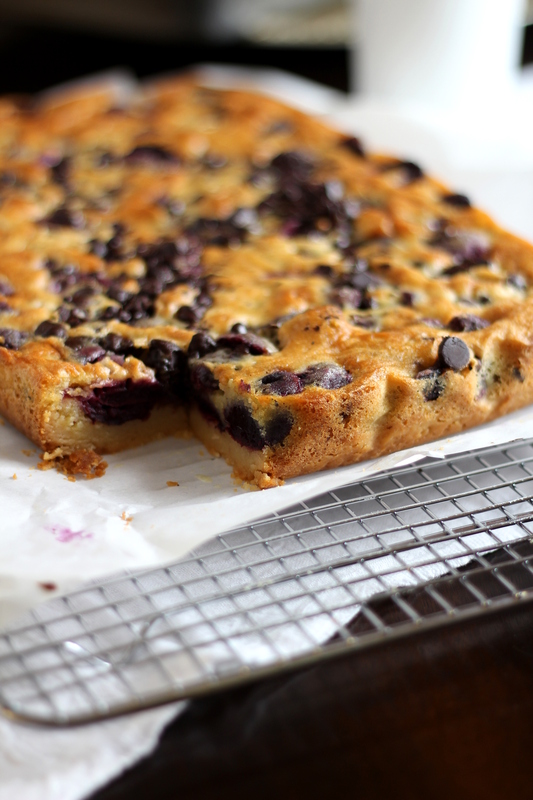 Arrange your cherries and chocolate on top of the cooled shortbread crust. Pour the filling mixture evenly over the top. Return the pan to the oven and bake for 28-32 minutes, or until the top has turned golden brown and a toothpick comes out clean. Cool for fifteen minutes in the pan, then use the parchment paper to remove the bars from the pan and place on a rack to cool completely. Once completely cool, use a serrated knife (bread knife works great) to cut into bars. Store bars in the fridge if you don’t consume them all within 24 hours. Looks delicious! You should submit the last photo to food gawker! Great picture! These look amazing. They're next on my "to do" list! I'm going to be so depressed when cherry season is over! These look amazing! One question, do you think you could substitute blueberries for the cherries? We're not cherry fans. Thanks! Absolutely! I happen to like chocolate and blueberries together, but if you don't, you might try white chocolate or nuts! Here is a little help on the cherries...Use a paperclip to dig the pits out of the cherries. What is vanilla bean caviar? These bars sound so delicious. Do you think I could substitute a gluten free flour? Hi, Karen! Vanilla bean caviar is the sticky black inside of a vanilla bean. If you don't have whole vanilla beans, you can substitute with a tablespoon of vanilla extract. I've never tried this with gluten free flour, but you might check out www.alldayidreamaboutfood.com - she has lots of great ideas! A straw works wonders are a cherry pitter, if you ever find yourself needing one!! My daughter and I are making these today during our Summer Baking extravaganza, and I can't wait to taste them! 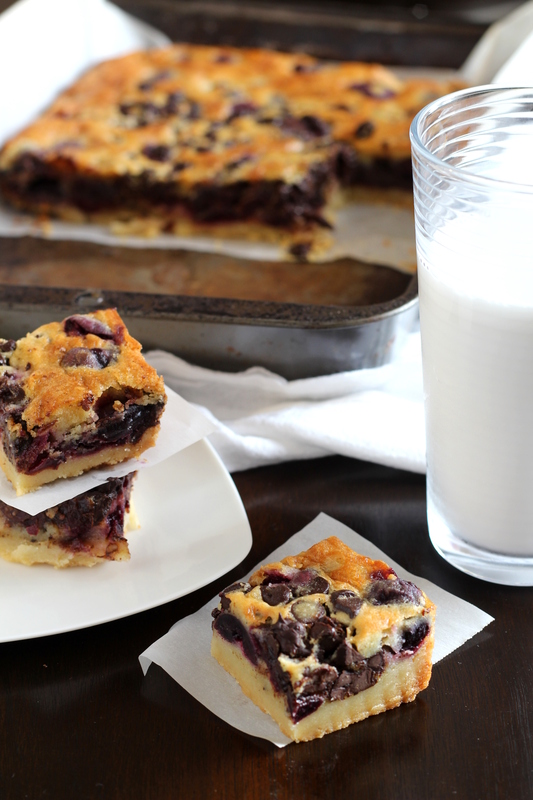 Have you tried these with frozen cherries?